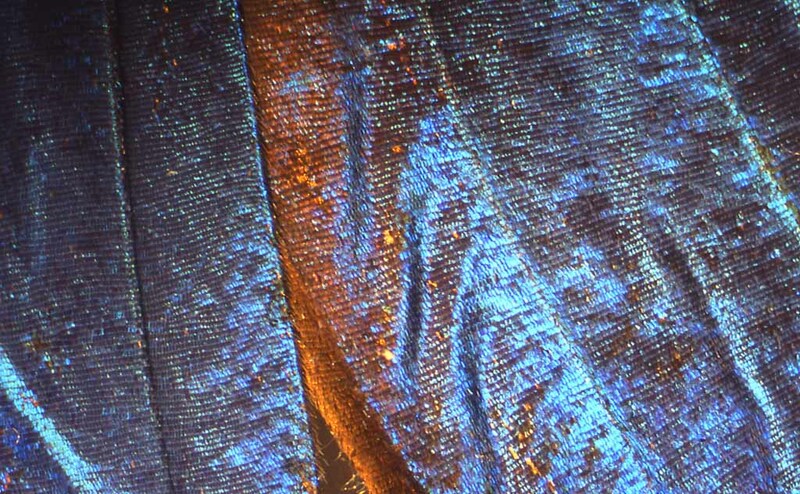 These were shot using an Olympus SZH-10 dissection microscope, incident light, and an integrated Nikon FG film camera and Fuji Provia slide film. The butterflies were part of colleague S. Mark Nelson's collection. May I offer a suggestion? White balance your light source. This is harder with film than with digital sensors but you still have to do it. The colors of these look way off. You could try to balance the digital scans in Photoshop. White balance the incident light for film images? Really? I think you have your media mixed up. I used a Spyder to calibrate my monitor when I scanned these slides, and they were originally saved using Adobe RGB color (not s-RGB as required by the forum). 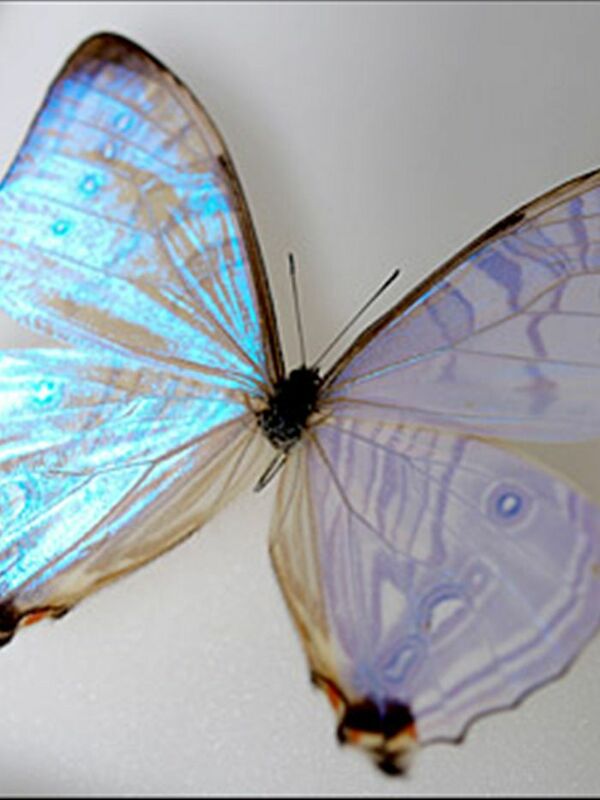 I assume you are referring to the blue morpho images? How are they "way off"? Red shifted? Cyan shifted? Why not show me what you are talking about? I assume you have photoshop available. Why not "fix" the morpho images tell me what you did to to correct the colors? That would be helpful, and welcome critique. If you use daylight-balanced film, you must filter your light source so that it has the same spectral distribution as daylight. Your pictures look like they were illuminated by a much warmer light source, like incandescent light. The normal thing to do would have been to put a color-correction filter on the camera or light source so the incident light spectral distribution would match what the film expects. Then, white objects will appear as white. The mismatch is obvious in your photos, especially in the last three. 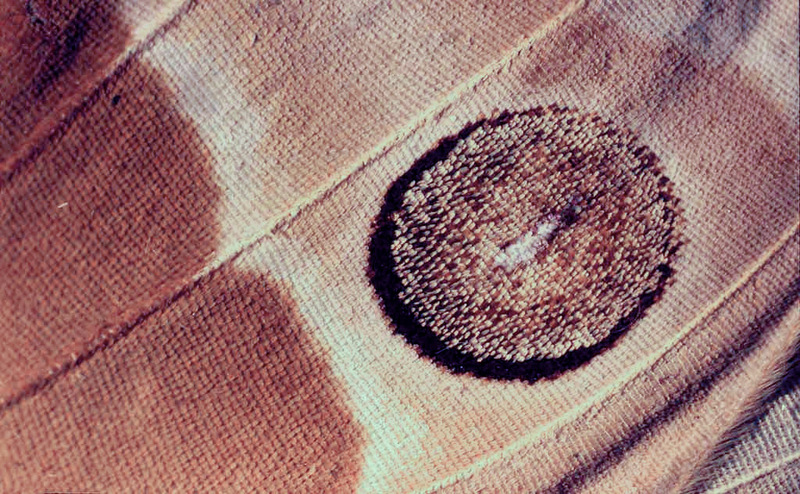 Probably the diagonal band of lighter scales across that image just to the left of the eyespot are more nearly white. Likewise in the third-last photos I will bet you that those light spots are white, not yellow-orange. Everything has the classic orange tint of a photo taken under a light source whose color temperature is mismatched to the film. This was a common problem back in the days of film. I don't miss those days. 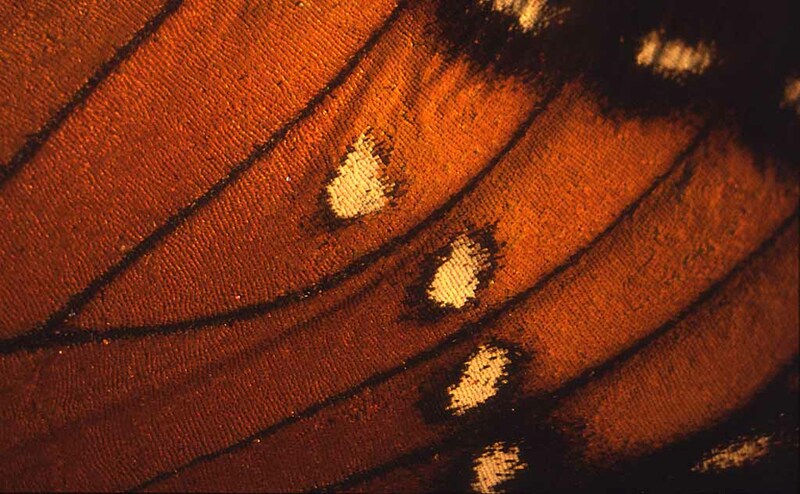 We can check the colors if you can tell us the species of butterfly which has that eyespot. Note especially the white band, which is bright orange-yellow in your picture. Lou - thanks for the comments and critique. I understand what you are saying and now see your comments were addressing correct and accurate color rendition of a biological specimen. My intention in shooting these images, however, was to obtain natural abstracts as backgrounds for my collages or as subjects for abstract paintings. I am not a technical photographer or scientific illustrator, so correct rendition was not a goal. My focus has always been artistic form and composition, not accurately rendering nature. My focus has always been artistic form and composition, not accurately rendering nature. That's a completely legitimate goal, of course. Even so, you might want to try to match your film to your light source, not necessarily for accuracy but to have a wider palette. It gives you more to play with in order to achieve your goals. 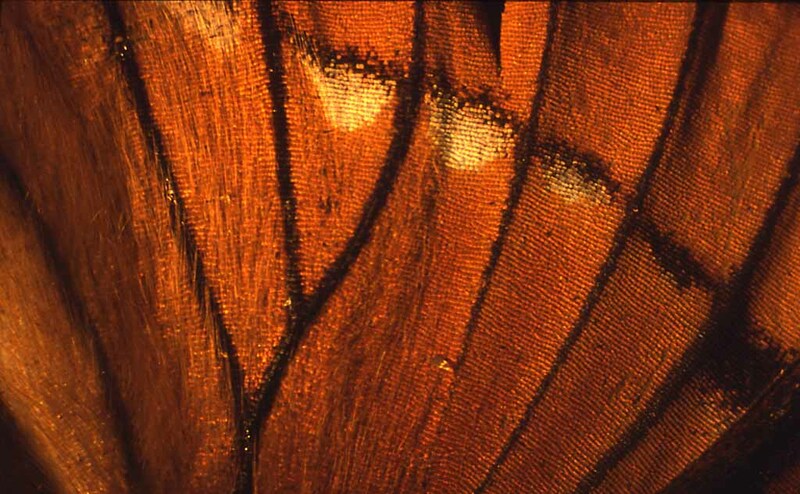 You can always turn everything orange in post-production if you want, but you can never get back the subtle colors and patterns that were on the wings originally, and it might have been these patterns that first caught your eye. Thanks, Lou! You make good sense for film photography. I am shooting digital exclusively, however, so the issue of light source/temperature is pretty much handled by the camera with Auto white balance. Yes, that's one of the best things about digital photography! I am shooting digital exclusively, however, so the issue of light source/temperature is pretty much handled by the camera with Auto white balance. Be aware that auto white balance is prone to fail badly for subjects like this. The reason is that auto white balance tries to make sense of the colors that it sees in the frame. When the entire frame is full of color, the camera really has no idea what the correct white balance should be, so it's reduced to guessing. Is that a yellowish brown subject illuminated by daylight, or a gray subject illuminated by incandescent? There's no way to tell just by looking at the light that hits the sensor, so the camera will arbitrarily choose one or the other or something else. If you did care about accurate colors, then the right thing to do would be to shoot a gray or white card using the same illumination and optics as your brightly colored subjects, and set a manual white balance from the gray/white card. If you're shooting in raw then you can make the adjustment later in raw processing instead of during the shoot, but still you need that image of the gray/white card shot using the same setup as your subjects, to calibrate the white balance. One thing that would be fun to try with the morpho wings is to add a source of transmitted light from underneath the wings. 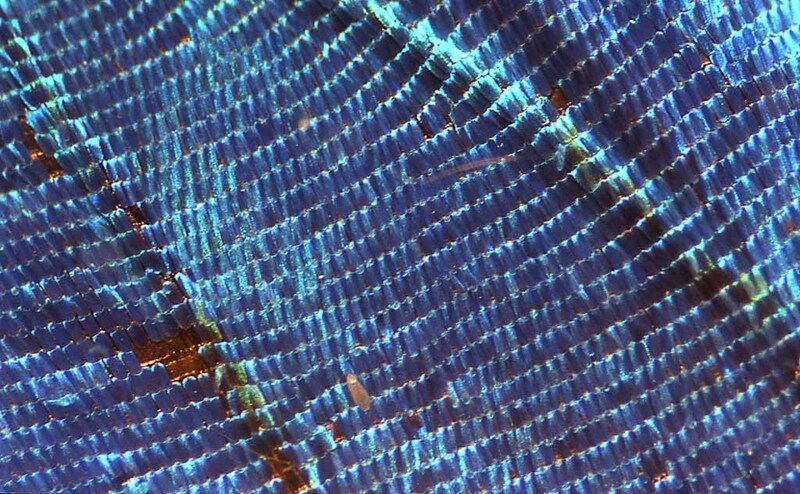 If this light source is stronger than the light coming down from above, it pretty much wipes out the iridescent blue structural color, leaving only the washed out brown pigment that characterizes the underside of the wings. 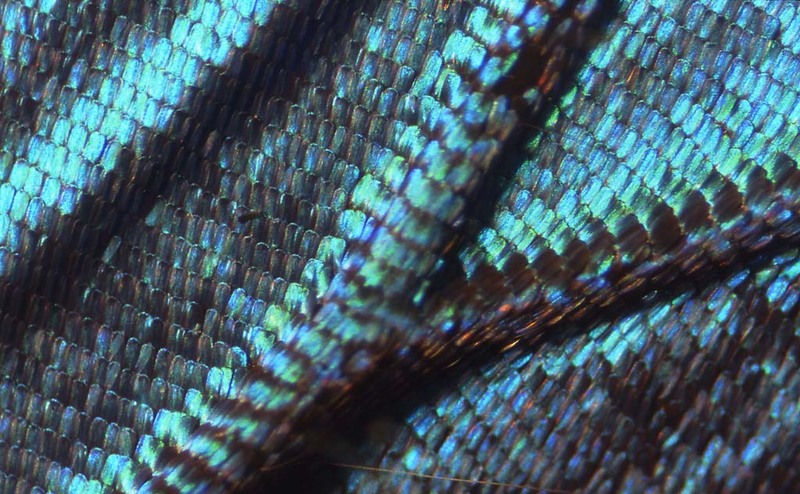 To see what I am really getting at, zoom in on an area of the wings where both brown and blue colors interplay in close proximity. I bet under a microscope the effect will be rather mesmorizing. I also see that you maybe have some of it in the first picture. Mark, my local Morpho species, M sulkowskyi, is translucent, with a yellow patterned underside and a silvery blue sheen on the top that often disappears in flight. This is one of my favorite butterflies in the entire world. They are like fluttering half-silvered mirrors. Every once in a while I even see these in my yard!! Maybe once every five years. I took a poor video of one of these crossing a mountain pass along a road in Peru...maybe I can extract something from that one of these days. A video is the only way to appreciate the translucence properly.